An Android Central forum member was lucky enough to receive the Android 4.0.4 OTA update on his Verizon Galaxy Nexus before anyone else. The update has since been extracted and made available for everyone else to download and install. As you may know, the Galaxy Nexus was still running on Android 4.0.2, which had a couple of issues and was also lacking a few things that were added in 4.0.3 that was released for the Nexus S. This new update brings the Galaxy Nexus up to speed and also changes some of the problems that the previous version had. New Power Menu. 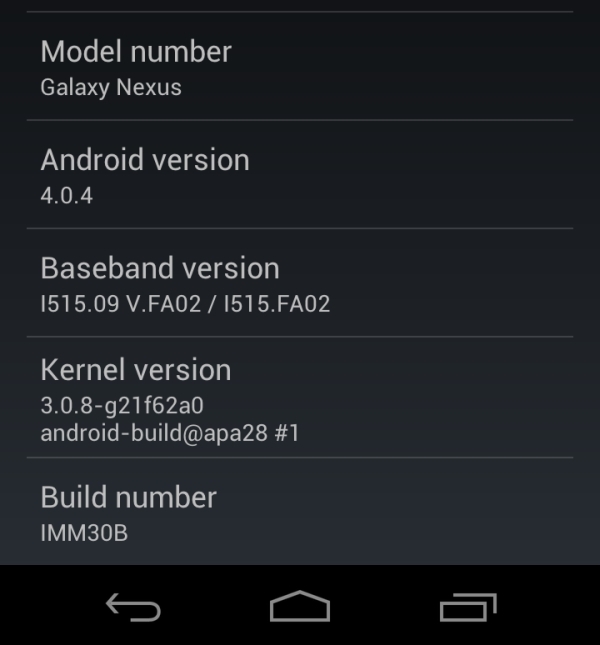 New from 4.0.2, similar to the one on the 4.0.3 ROM. Auto-brightness Functionality changed. Smoother transition. Holding down camera button now refocuses again. Recent apps list opens faster. Updated News & Weather app UI. Improved quick controls in browser, similar to the ones in 4.0.3. The link to download the update can be found in the source link below. As mentioned before, this update is only for the Verizon CDMA version and not for the GSM version. If you have an iphone what are you doing on this page? You must have no life and be a real loser if this is all you have to do!! And follow the pack. Blindly. And a considerably lighter wallet. Sounds like a good idea. Android is an OS and the mobile phone is not.